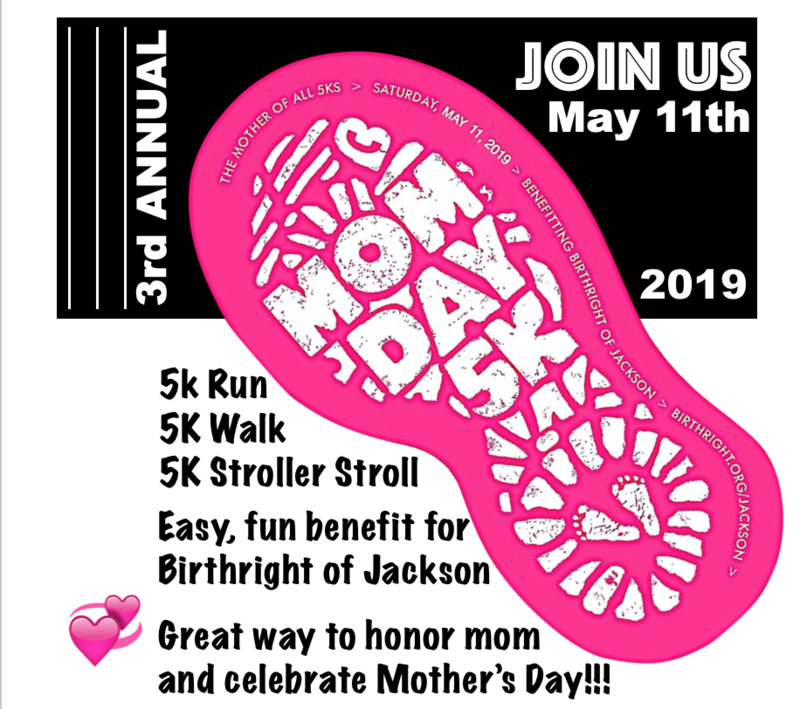 May 11, 2019 ~ Run, Walk, or Stroll to honor moms & support Birthright of Jackson! It's the Mother of All 5Ks! Sign up for the Mom's Day 5K - - Run, Walk & Stroller Divisions! So much fun!! Run/Walk/Stroll in honor or memory of your mom! Run/Walk/Stroll because you are a mom! Run/Walk/Stroll in support of expectant moms! The race begins & ends at the Birthright office. Parking at Tico's Steakhouse (County Line Rd), directly behind the Birthright office. Walk to connecting Birthright parking lot and starting line! We welcome all runners, walker, or parents with strollers! All children in strollers receive a plastic medal of participation! We begin and end at Birthright of Jackson's new location. Park at Tico's Steakhouse (1536 E County Line Rd in Ridgeland). Follow signs to the adjoining Birthright parking lot. The race will begin at Birthright, exit the office property and turn left onto S. Pear Orchard. Next, turn left onto Northpark Drive, then left onto Ring Road. We will circle the Northpark Mall perimeter and exit onto S. Wheatley Street. Turn right on Wheatley, then right onto Lake Harbour Drive, then right onto S. Pear Orchard Rd, and finally right into the Orleans Square property. The finish line will be directly in front of Birthright office! We will have signage and volunteers marking the route. See you there!